Jerusalem Day is a Day of Remembrance in the Ethiopian Jewish community, for the thousands who didn't manage to complete the trek to the holy land. 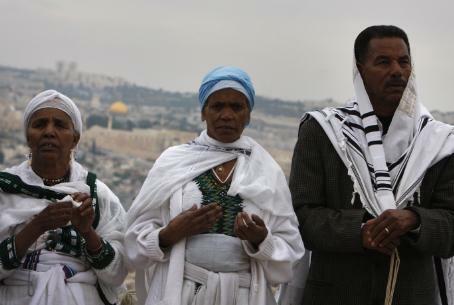 Yom Yerushalayim – Jerusalem Unification Day – is the day Ethiopian immigrants memorialize the thousands who died or were killed on the their trek through the Sudan to reach the planes that would bring them to Israel in Operation Moses, the first aliyah from Ethiopia. “Decades ago, [they] left their homes in the dead of night. They went to the Land of Israel. They went to Jerusalem. They organized secretly, in small groups, left all their belongings behind, and began their own exodus to Jerusalem,” Prime Minister Binyamin Netanyahu noted Wednesday in special greetings on the holiday. For Ethiopian Jewry, Jerusalem, rather than the entire State of Israel, was all they dreamed of throughout their years in exile. But for this particular population, isolated as it was from the rest of the world, Israel's capital was more of a spiritual dream city rather than a real city. “They marched for long weeks, sometimes longer, with babies on their backs, children holding their grandparents' hands. They went north, toward the horizon, in the direction of the Land of Israel. Some 4,000 Ethiopian Jews died trying to reach the “Promised Land,” according to Avraham Edga, who in 2000 wrote (in Hebrew) a book called “The Journey to the Dream.” Edga himself was one of those who trudged through the desert sands to reach the mechanical silver birds that would wing them away to the city they always dreamed of. Setting Jerusalem Day as the day of remembrance for those who died trying to reach Israel, said Netanyahu, made sense. “This is the day our capital was liberated from the yoke of foreign occupation, the day on which we were united with the eternal city of the Jewish People.